Local government bodies such as municipal and regional councils play an important role in our political system. 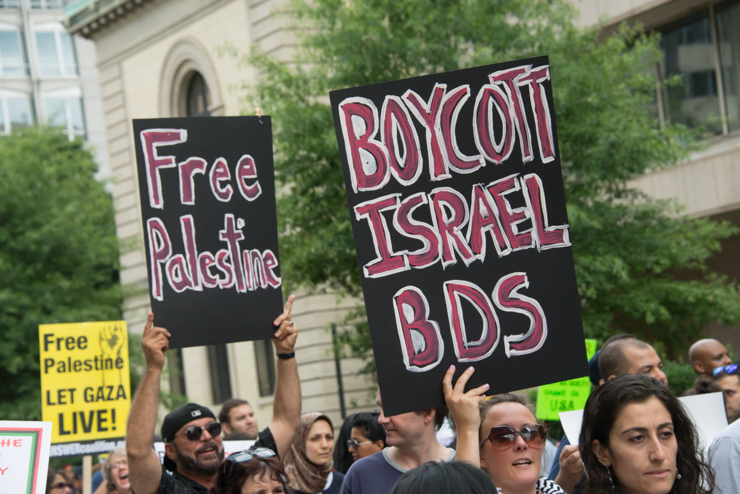 Dozens of local authorities across Ireland, Norway, Spain, Sweden, France, the UK, Italy, Belgium and Australia have passed resolutions that support BDS or that pledge not to deal with specific companies targeted by the BDS movement. These decisions are powerful displays of solidarity with the Palestinian struggle for freedom, justice and equality. Local government bodies such as municipal and regional councils play a key role in our political systems. They often have relationships with companies and institutions that help Israel to oppress Palestinians. Campaigning for local governments to take action in support of Palestinian rights is a vital way to build meaningful solidarity that reflects community values. Several multinationals such as Veolia have ended their participation in Israel’s crimes after losing contracts and facing pressure from local government bodies. For more information on the specifics involved, check out Stop the Wall's resource Local Authorities In Support Of Palestinian Rights or click Find Out More. Many local government bodies have investment and procurement relationships with companies that help Israel to violate Palestinian rights or twinning relationships with Israeli local government bodies that participate in Israeli violations of human rights. 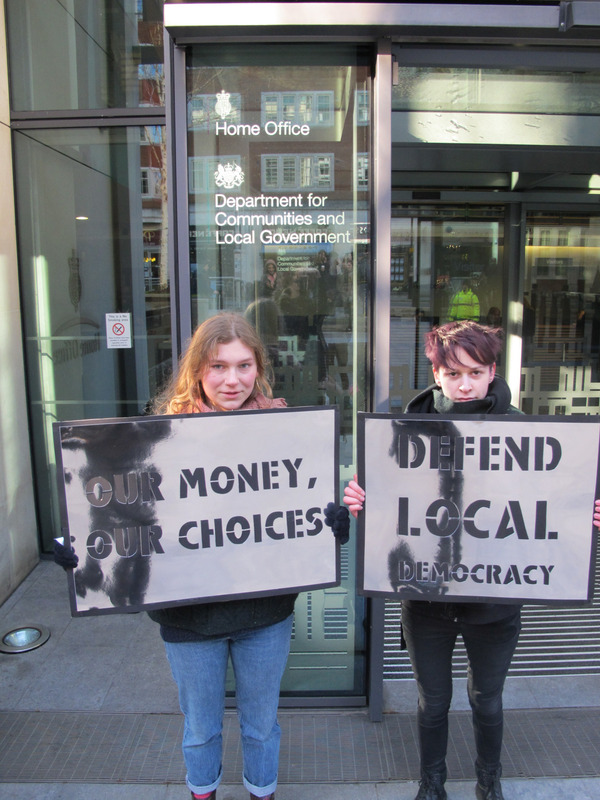 Local governments have an ethical responsibility and a legal obligation to break ties with companies and institutions that are involved in recognising, aiding or assisting Israeli violations of international law. 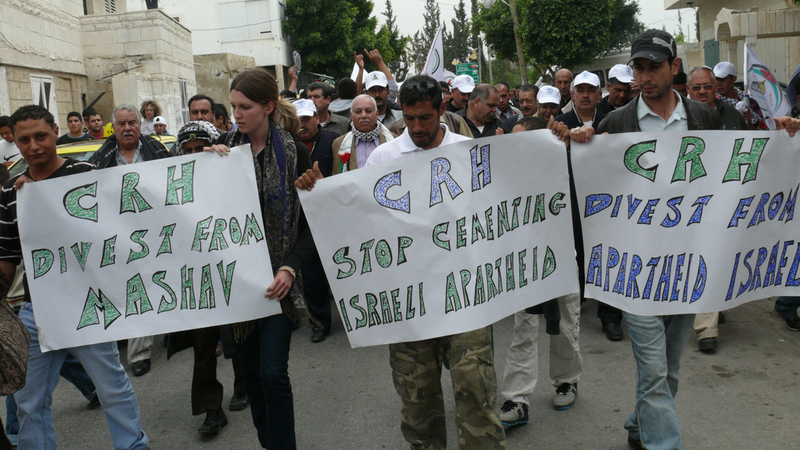 Protesters in Bilin in the occupied West Bank demand the construction company CRH to divest from the Israeli agency Mashav. National governments are failing to hold Israel accountable or take steps that can help Palestinians realise their right to self-determination. This means that local governments, who have historically been an important part of upholding human rights and extending solidarity, have a vital role to play. In December 2014, the Olive Declaration was published as the concluding document of the International Conference of Governments and Civil Society Organizations in Support of Palestinian Rights. It called on local governments and councils to adopt ethically responsible measures and to not give support to companies or institutions that help Israel to violate Palestinian rights. Participants of International Conference of Governments and Civil Society Organizations in Support of Palestinian Rights call to intensify BDS. Local government actions should reflect the values of the community they serve, including on human rights and Palestine- related issues. Public opinion is increasingly in support of Palestinian rights and local governments should reflect this in their policies, especially with regards to how public money is spent and invested. 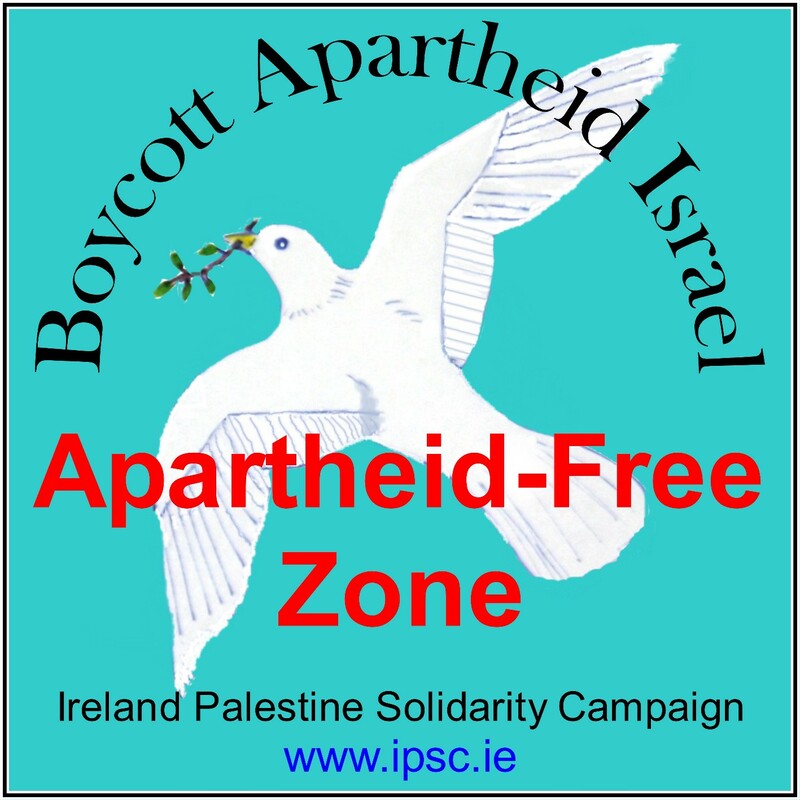 Apartheid Free Zones is a new initiative that aims to build community support for the Palestinian struggle and for BDS. In Spain, community activists are inviting shops, restaurants, community centres, businesses, trade unions and other civil society organisations to declare themselves to be an Apartheid Free Zone. An organisation that wants to be an Apartheid Free Zone commits to supporting BDS, and boycotting Israeli products and institutions and to publicly declaring that it is an Apartheid Free Zone. In 2015, French corporation Veolia sold off its Israeli businesses including its role in the Jerusalem Light Rail, a tramway project built to help Israel connect up and expand its illegal settlements. Veolia took this decision after local governments in countries across the world had taken the decision not to award it contracts because of its role in Israeli violations of international law. Veolia lost contracts worth at least $20bn. Veolia’s withdrawal from Israel was a pivotal moment that showed how our movement is capable of holding corporations that aid and abet Israel’s human rights violations to account. Similarly, G4S has moved to distance itself from its role in Israeli violations of human rights after a number of local government bodies boycotted it. 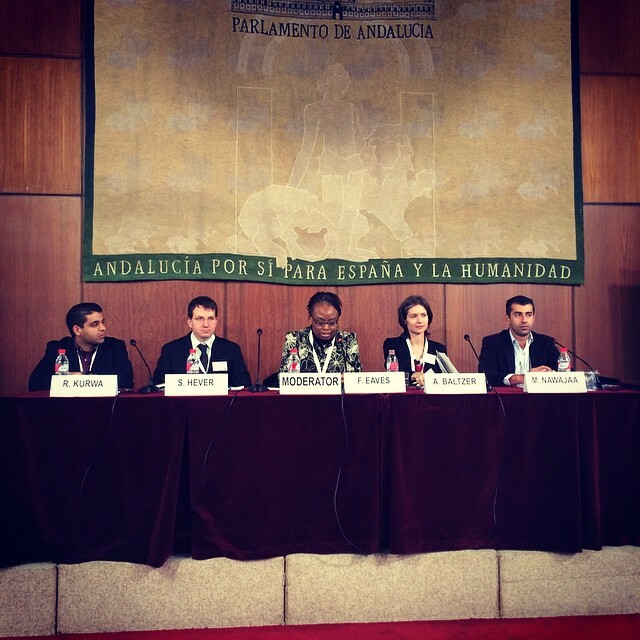 Local councils are playing an absolutely vital role in promoting respect for human rights. Local community organising is leading to local government bodies taking principled steps in support of Palestinian rights. In 2015, French corporation Veolia sold off its Israeli businesses including its role in the illegal Jerusalem Light Rail project. This was a direct result of local governments across the world taking the decision not to award it contracts because of its role in Israeli violations of international law. 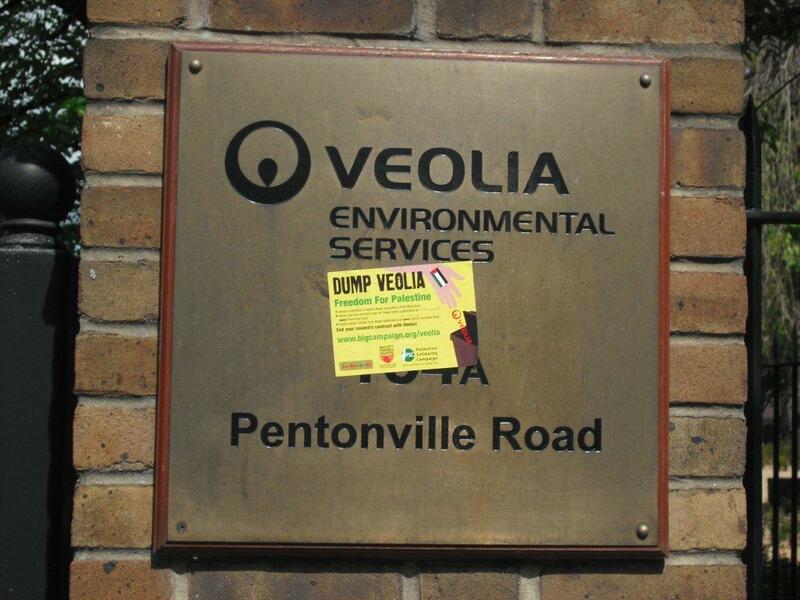 Veolia lost contracts worth at least $20bn. Grassroots community organising has led to many local councils taking a powerful stand in support of Palestinian rights. Help us get the support of even more local government bodies. 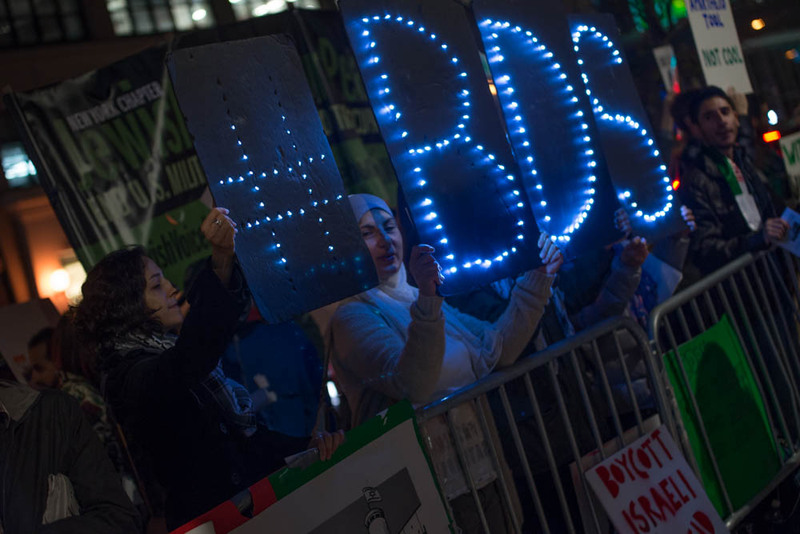 Dozens of local governments have passed resolutions in support of BDS. Share this page to help spread the word and share this page on social media. Working alongside your local elected representatives to pass a resolution through your local government body can be a hugely rewarding and impactful long term project. Get in touch for support and information and for help with writing a motion. Are you an elected representative in a local government? Get in touch! We would love to discuss with you how we can work together to build support for BDS and actions in support of international law within your local government. Please contact us. Check out Local Authorities In Support Of Palestinian Rights, a resource from Stop the Wall. Write to your local elected officials to help them to understand the Palestinian struggle for freedom, justice and equality and the need for local authorities to take action. You could even share this page with them! Before you bring a resolution to vote, it is important to meet with and build support among local community groups, trade unions and faith groups for your proposal. An open letter signed by these organisations and members of the public can help to show your local government that there is wide community support for your resolution. A town hall event or a workshop can be a great way to educate elected officials, local media and and the wider community about the Palestinian struggle for freedom, justice and equality and the importance of BDS initiatives by local governments. Once your resolution is passed, it is important you monitor its implementation and make sure that your local government takes the steps the resolution commits it to.